This report chronicles what I expect will be several different weeks bicycling along the Pacific Coast. The overall plan is somewhat similar to how I cycled the Atlantic Coast in 1995: do the segments a week at a time, each time starting where I finished off. Gives me a nice chance to relax with several breaks in between. So far this report describes the first two segments: Vancouver to Eugene and Eugene to San Francisco. Thursday at 9pm, twenty-two hours before departure and I hadn't packed a thing! Fortunately, with the use of tried and true checklists I was able to fairly quickly assemble my gear. This would be a trip where I'd bring both camping gear and a credit card, "just in case". Overall bicycle weight was pretty heavy with myself and all my gear. Fortunately, I had replaced my rear wheel with a 48-spoke tandem wheel to help carry the load. Friday afternoon at 4pm I had finished my work for the week. I wheeled my loaded bicycled out of my office area, walked it outside and rode away towards the San Jose Airport. Wonderful! Finally on the road again. Mostly uneventful flight to Vancouver, BC. Changed planes in Portland and took a second hop in Seattle. First flight was late so I did the mad airport dash in Portland and made the connection. While I didn't change in Seattle, I briefly checked with the attendant. In the process, prevented them from accidentally unloading the bicycle in Seattle, whew! Vancouver airport nearly deserted when we arrived after midnight. Gave me plenty of space to slowly put together the bicycle and all the gear. A young woman sat watching. She was clearly distressed. I asked if I could help. "Do you know anything about Vancouver? My friend was supposed to meet me here and she isn't here!" I pointed out that she was still waiting in the international zone and had gone through passport control but not yet customs. Hence, her friend wouldn't be able to get into this zone. She thanked me and was off. I walked through customs area and didn't see her so assume things were better after that! It was late and dark, but fortunately only about two miles to the nearest hotel. Got to sleep about one AM. Left the Delta hotel about 7am. I hadn't done much advance planning for this section so found myself in a strange city without Canadian $ or a clear sorting out what direction I was supposed to take. Fortunately, found an ATM machine and looked things up on the map. 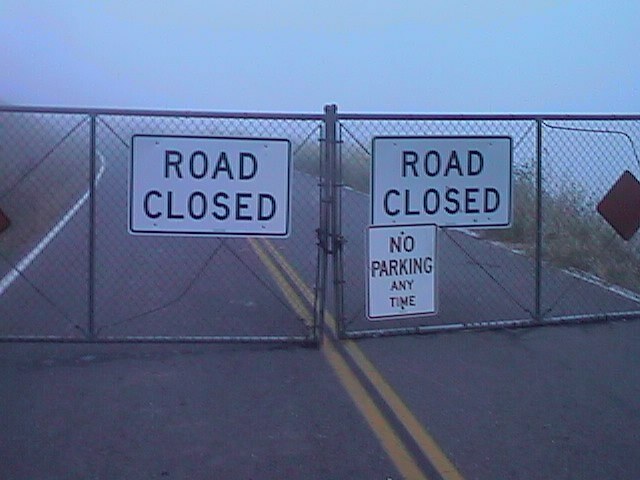 My first attempts to bicycle along route 99 failed because bicycles were not allowed. Fortunately, slowly picked my way through the Vancouver suburbs via Alexander Fraiser bridge and then Richmond, Delta and Surrey. Vancouver suburbs were a mixture of strip malls, rural and suburban tracts. Some gently rolling hills but nothing too steep. Still the bicycle felt sluggish. Lots of extra weight and not being in best of shape starting out. Skies were overcast though still staying mostly dry. Reached the US border shortly before 11am. Very nice peace arch and provincial park. Long line of cars waiting to cross the border. Fortunately, I was able to go alongside and cross as a pedestrian. Stopped in Blaine for very helpful tourist information. Also a first chance to see the Pacific, or really a bay off of the Pacific. Stopped at the Casco restaurant, but their service was poor so left down the road. Nice quiet back roads along the way to Bellingham, WA. While it was only 2:30pm, I was actually feeling a bit tired for the day and decided to stop here. Just before entering town, witnessed a traffic accident where a red pickup truck came barreling through red light to be hit by a black Honda. Wow! Fortunately, occupants were startled and upset but apparently not hurt. Bellingham is an interesting and somewhat eclectic town. Within a few blocks of downtown I saw: a large town paper mill, several colleges, pawn shops, pan-handlers, a hemp store, several bike stores and outdoor shops, many small cafes, some artsy shops, a juice bar and lots of interesting people. It was actually a holiday in Bellingham with a large parade. Later in the evening, the Doobie Brothers would be playing at a concert. Watched the Memorial Day parade for a while. It was a well done parade and had a good sense of balance. This is somewhat unlike my experience with parades in New England (over-abundance of fire trucks) or Iowa (over-abundance of farm equipment). There were perhaps a few too many beauty queens and boats, but not overly so. There were a number of interesting floats including ones from the retirement center, the bowling alley, a gas station and others. Got an early night's sleep and a chance to rest. On the road by 6am. Overcast skies and on the verge of drizzle. Luckily mostly dry. I briefly stopped at the Exxon food mart on the way out of town. Proudly displayed was the first place prize from the parade the day before. They had an ok float, but in part had earned this by flooding the town with some 1700+ tiger tails. They were everywhere, not just on and around the float. Left on Chukanut drive. Very nice scenic route right along the bay. Apparently, the road hadn't been constructed until in the 1920s or so. Prior to that, transport to the northern coast was via railroad and boat. Route climbed over and around some hills, but made up for it with some very scenic views. Shortly before Edison, the road flattened out and went through farmland. Open land was also an invitation for the wind to pick up and blow along the way. Stopped in a Bow for a nice breakfast. The small cafe seemed to specialize in hunting signs. After Edison, followed 237 over some low hills and then turned westward towards Fidalgo and Whidbey Islands. Some hints of light rain, but fortunately nothing too bad. Crossed pass the casinos and was on the island. This route became a bit more wooded than before. Deception Pass bridge was the high bridge between Fidalgo and Whidbey Islands. Stopped briefly for the obligatory pictures as well as a stop to pick up more tourist information. Whidbey Island itself is a popular tourist and vacation area. Also has several naval air stations. 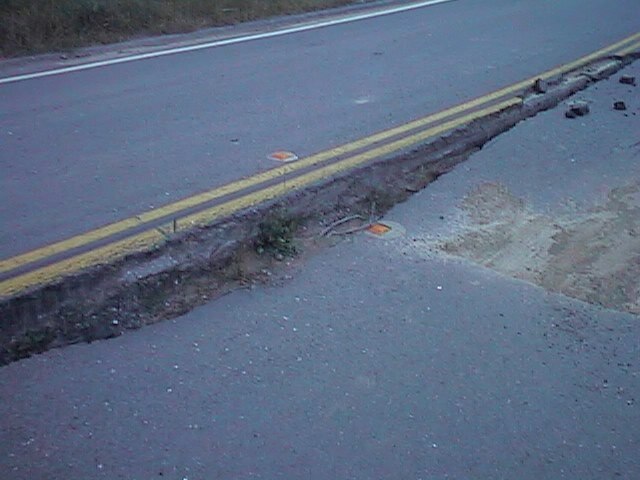 The road on Whidbey was wound back and forth but was pretty level otherwise. Stopped briefly in Oak Harbor for lunch. Saw several signs of Dutch settlement and names around Oak Harbor. The windmill above was apparently one of two windmills in town. Also several street names such as "koetje". From Oak Harbor, slowly made my way out to the ferry from Keystone to Port Townsend. Made it in plenty of time for the 2:45pm ferry and was in Port Townsend shortly after 3:15pm. I had agreed to meet Stephen at the Port Townsend Youth Hostel at Fort Worden. Bicycled out to Fort Worden. This area was a backdrop for where "An Officer and a Gentleman" was filmed. Waited for a while at the Youth Hostel until it officially opened at 5pm. In the meantime, a downpour hit. Fortunately, nice to be mostly done for the day. The youth hostel was full and Stephen left a note he was arriving late. So left a message and found a motel back in town. Got somewhat wet, but nothing too bad. Stephen and I talked later that evening when he arrive. 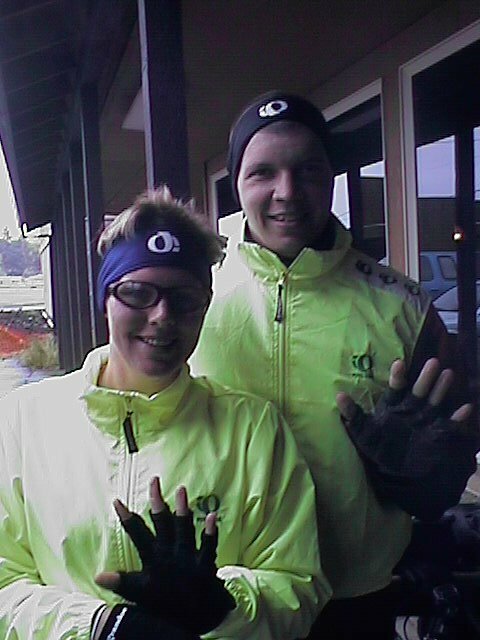 Our original plan had been to bicycle around the Olympic Peninsula and down the coast. After doing some reading along the way, and recognizing shape I was in, I realized I would be happier taking the inland route which would allow me more time also to get to Eugene. Stephen and I decided to part company and perhaps meet up later down the coast. (Few days later Stephen left a message on my machine, the coast had also been a bit too much for him, so he was stopping and taking the bus down to LA). Awoke to a steady pouring rain. Dampens both the body and the enthusiasm for leaving real early. However, by 6am I was well on the road. As I was bicycling up the hill, heard a rhythmic scraping. Stopped and investigated. Apparently my rear brakes were pulling to one side and rubbing. Tried unsuccessfully to fix things up, and ended up disabling my rear brake for the rest of the trip. This meant some challenges, but was better than the extra friction. Wonder how much of the sluggishness of the previous two days was due to bad brakes. Route 20 climbed some higher hills before descending and meeting down to meet 101. I disabled the brake on the ascent but re-enabled it on the descent to keep from going too fast. Rain was still miserable but was slowly decreasing. I was getting a bit hungry but didn't find an immediate area to stop. At 8:06am I saw my shadow. First time in the three days since I left San Jose! Sun came out briefly. It still showered later that morning but was nice to also occasionally have some sun. Found a nice cafe for breakfast at Quilcene. I was starting to come into some of the logging areas. This cafe had prominently displayed a box of "Spotted Owl Helper". After Quilcene, the road winds itself over and around some low hills but generally keeps along the Hood Canal. 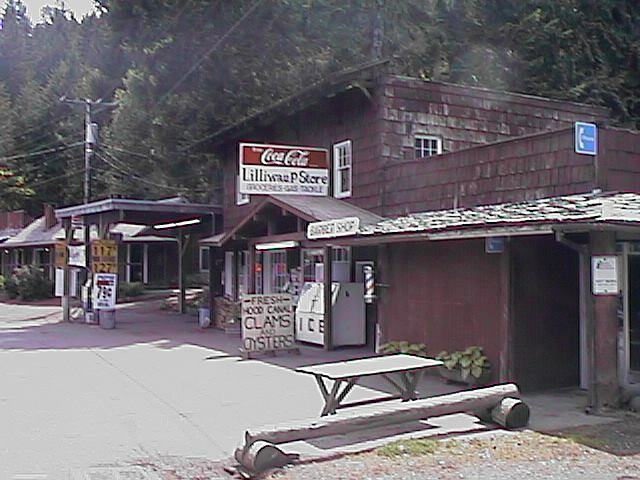 Towns of Binnon, Eldon and Lilliwaup are nice small communities that appear to be a mix of resort towns and otherwise backwoods areas. Town of Hoodsport had a very nice ice cream stand that made a good excuse for a stop. Fortunately, after lunch it stayed dry for the day. From Hoodsport climbed over several low hills and ended up in Shelton in the early afternoon. Apparently, Shelton is famous as Christmas Tree town USA. I saw several Christmas tree farms on my way into town. Cold and crisp morning. Bank thermometer said 35 degrees and it felt it. A few miles of busy road in Shelton before turning off on #108 towards the coast again. Nice quiet route with only occasional logging trucks. Still trying to figure out the locations of the mills by whether the trucks were passing full or empty. Stopped in McCleary to warm up and get some nourishment. Small town cafe where there was a large group of seniors having their particular social gathering of breakfast and conversation. Overheard the talk about frost on the windows and abnormal cold temperatures. From McCleary the choice was either the two lane, almost interstate #8 or the side road. Decided to take the main road and benefited from the long flat stretches. Wow, amazing to be cruising much faster than before. Had a nice stop at Montesano before heading inland on #107 and #101. This route was mostly wooded with some nice shoulders. Came into Raymond for a late lunch. 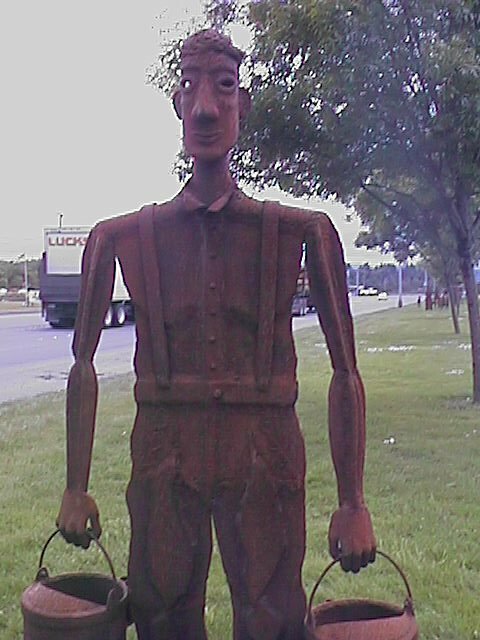 Raymond had quite a few iron sculptures like the one above. Some enterprising artist must live there. Raymond also had its collection of paper mills and a downtown area that had seen better times. On local recommendations, made my way to the "Pizza Loft" for a good lunch. Sign on the door said, "Due to economic conditions will be closing at 3pm on Mondays and Tuesdays". As I left lunch, the weather looked ominous. More rain on the way. Apparently, South Bend was last motel for a while, so this is where I stayed. Had a good walk through South Bend and visited the local museum (free) and also briefly the courthouse. Otherwise sat reading while the rain came down outside. Rain on the roof on awakening. Decided to try wait out the worst, and had breakfast in the local cafe. Unfortunately, didn't look like it was going to stop much so headed out at 6:30am and made the best of it. While it was raining fairly hard, it was difficult to tell if I was more wet due to sweat or due to the rain. Saw less of the ocean on this part than I might have guessed. Turned onto a flat stretch of #4 and headed towards Naselle. My glasses were fairly misty and my left eye was starting to hurt. I figured it was because I had some hard raindrops coming in between the glasses, but wasn't completely certain. Fortunately, made my way into a cafe at Naselle and got a bit warmed up with tea. From there over a few hills until I reached the Columbia River. Last several miles in Washington were along the Columbia and flat. Rain even let up for much of this stretch. Found a nice tourist booth and got more information about Louis and Clark along this stretch. After leaving the booth, departed for four miles of bridge across the river to Astoria. Midway on the bridge, the rain started again. Close to Astoria, the bridge climbed high over a passage for ships. Off to the right side I could see the Battleship Missouri. The Missouri had been decomissioned in Bremerton, WA but was now on its way to Hawaii to become part of a permanent memorial. It was spending several days in Astoria to let the fresh water kill the sea life. The Missouri was a big event and drew big crowds from the Portland area. Left Astoria and stopped in Warrenton for lunch. Getting a little tired of the rain, so stopped for a long lunch. Finally decided to get a motel in Warrenton rather than keep getting wet. Ironically, about an hour later the sun came out and it was beautiful. 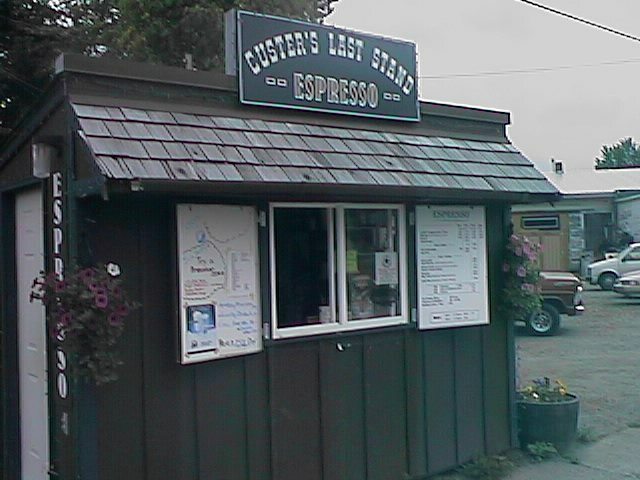 Astoria/Warrenton was a special place. Just over six years ago this had been the start of my cross-USA trip, so these two trips were now "connected". Wonderful sunny day! Hooray! Left Warrenton early and decided to make a longer day of it. First twenty miles to Seaside were very flat and so I made excellent time. From here a low hill over to Cannon Beach but I was in good spirits and hills went fairly quickly. This next stretch had some very pretty coastline. Numerous small beaches separated by little hills. Rocks sticking out into the ocean. Waves and sea. The hills past Cannon Beach climb for several miles and include the Arch Tunnel. This tunnel had been closed until just few weeks before and thus were only open to one lane of traffic led by a pilot car. I took my place in line and pedaled as fast as I could despite the tunnel also being on a hill. Saw several other cyclists along the route. This was definitely a popular bicycle route. Outside Nahalem the road went around the bay. Good excuse to stop on the other side at Wheeler for a short stop. Bright sunshine sure made a difference. My odometer had been broken on this trip, so I had relied on road mileage markers. There was a discontinuity outside Wheeler: 46,47,48,Z45,Z46,Z47,Z48,Z49,50,51,52...Not quite certain what to make of this. Stopped at the end of the morning in Tillamook. Among other things, the town is known for its cheese. I stopped at the large Tillamook cheese factory outside town. They had some nice observation decks to see the factory. Also had gift shops full of cow paraphanelia. 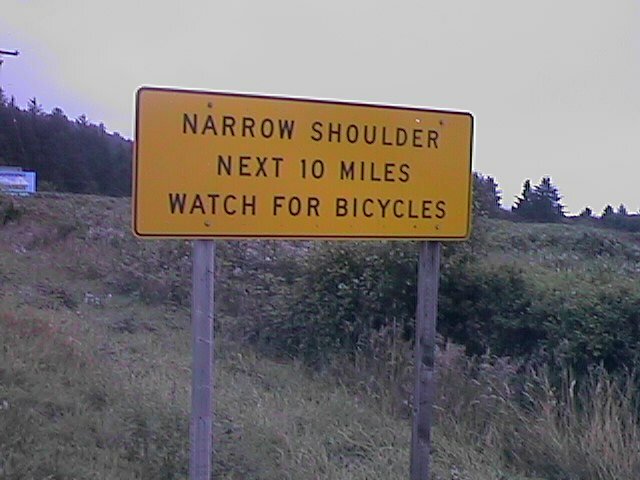 Otherwise, Tillamook wasn't the most bicycle friendly town with narrow roads and several obnoxious motorists in this stretch. 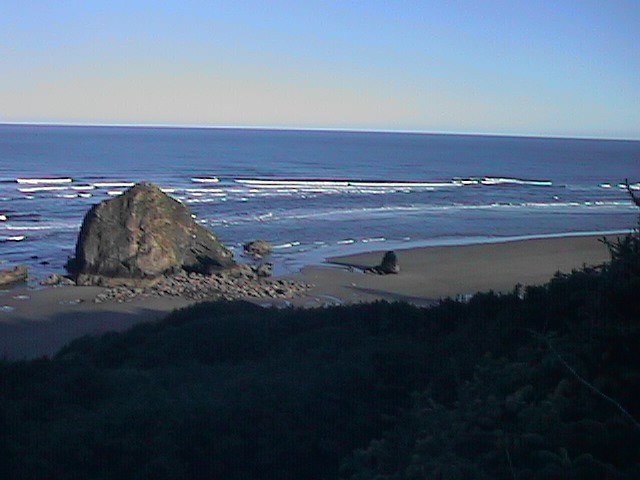 From Tillamook, the scenic route and bicycle route goes along the coast on the Three Capes Route. I actually took the other route in this stretch and continued along 101. This road was also actually very nice, though the shoulders became very narrow through Beaver and Hebo. Outside Neskowin one climbs a large hill up to 750ft. Figured this was my 100 mile mark and was nice to reach that for a the day. I re-attached my rear brakes for some extra safety on the descent. 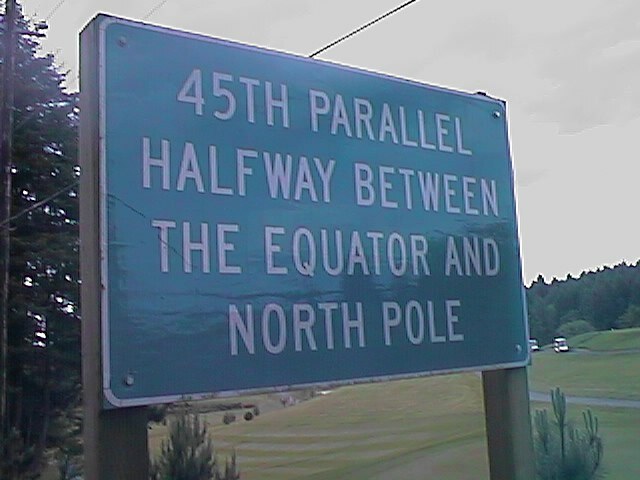 I crossed over the 45th parallel briefly and stopped in Lincoln City. It was becoming increasingly overcast, however this was definitely the best weather day on the trip. Stopped in Lincoln City to stock up from breakfast at Safeway. Weather forecasts were for rain, so wanted to cross over the coastal mountain range before the worst hit. Slowly climbed along a river valley as I rode away from the coast. Just outside H.B. Van Duzer state forest met up with two other touring cyclists, Rob and Shannon. "Where are you headed? ", "Virginia", "As in the state of? ", "yes", "wow!". Rob and Shannon had just started their cross-country trip several days before in Astoria, Oregon. They had gone along the coast before now turning inland. They were originally from Indianapolis. It was nice to ride and visit with other cyclists along this stretch. The locals had told me there were four hills to worry about between Lincoln City and Corvallis, but we only counted two. Road slowly wound itself through the valleys and out the drainage. It stayed dry until right around the point where 18 and 22 split. It then started raining, sometimes with a driving south wind. However, worst part was having the trucks come by and kick up extra spray. Got to be a bit obnoxious as we rode along. We cycled into Rickreal ready for a break from the weather. Rob and Shannon cycled briefly south with me and we had lunch in the restaurant in town. After this we parted company as they headed towards Salem and I towards Corvallis. Corvallis was into the headwind. Sigh. The wind and rain cut into the speed somewhat, though this region was pretty flat and thus made good time. I dripped into the local motel, but luckily they didn't seem to be too bothered with a damp cyclist. Home stretch for the first segment. Left about 6:00am and cycled down along 99W towards Eugene. A few small towns along the way but also lots of flat farmland and some pastureland. Outside Junction City the road became wider and also a bit busier. Bicycled past the Eugene Airport and then into the town. Got there a little before 9am. Found my way first to the tourist information office and then to the Amtrack Station. Folks at the Amtrack station were kind enough to let me box and check my bicycle so I could explore the town on foot. 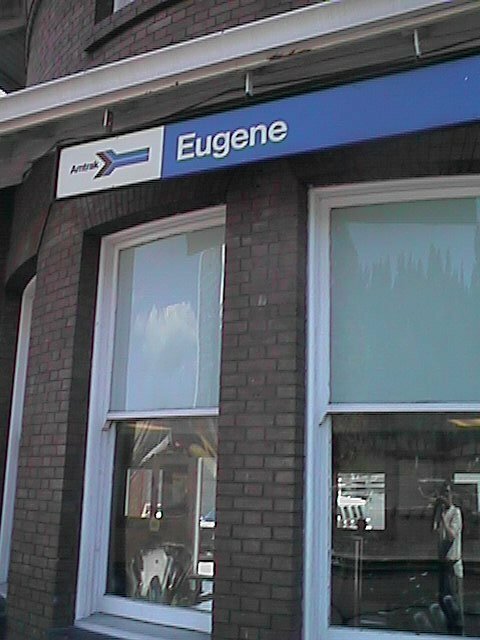 Eugene had a number of small shops, though the downtown also appeared fairly dead. Stopped briefly to watch a small parade from a local Christian Church. Saw some local stores including two bicycle stores and the local bookstores. Otherwise relaxed around town. Saturday evening I boarded the Amtrack train for an overnight trip to San Jose. I had splurged and ordered a sleeper compartment which made for a nice relaxing return. Came into San Jose around noon the next day, rested up from week of bicycle vacation. Reassembled bicycle and pedaled home. I returned to Oregon during the week preceding 4th of July to continue the trip. Several weeks in between left me plenty of time to get busy, but also a short enough time to anticipate the next leg. On Friday morning I cycled the loaded bicycle to work. In late afternoon, I cycled from work to the train station. I took the train to the shuttle to the airport. As I carefully boxed my bicycle for the trip, I reflected briefly: as far as I can count this is the 20th time I have flown with this bicycle. Flight up was uneventful. My baggage was even first to arrive for a change. Quickly reassembled things before cycling into Eugene for a night at the Pine Knot motel. Nice and cool at 5:30am when I got back on the road. Skies were overcast but dry and improving throughout the day. I was in high spirits as everything appeared to be running well. Bicycle was gliding easily. In comparison with the previous trip, I felt in better shape and had also jettisoned some weight from the bicycle. I had however decided at last minute to pack along the tent, sleeping bag and foam pad. Outside Eugene there are a few miles of strip before the road turns rural. Early morning quiet as I glided past Fern Ridge Lake. Stopped there briefly at the gas station where the attendant related that they'd seen much rain the previous weeks but forecasts were for dry and good weather. After Venetia a few more hills and some woods along the way, but nothing severe. Came to this tunnel with special accomodations for bicycles. 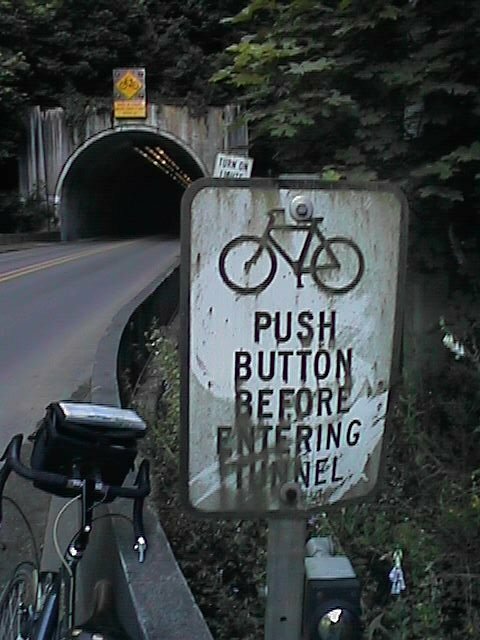 After you pressed the button, the yellow lights would flash "Bicycles in Tunnel". You would then proceed to cycle quickly out the tunnel. Luckily this was downhill. It continued downhill for several more miles after the tunnel until I got to Mapleton for my first stop of the day. From Mapleton roads continued flat with good shoulders until I reached the coast at 11am. Felt like good progress for the first sixty miles. 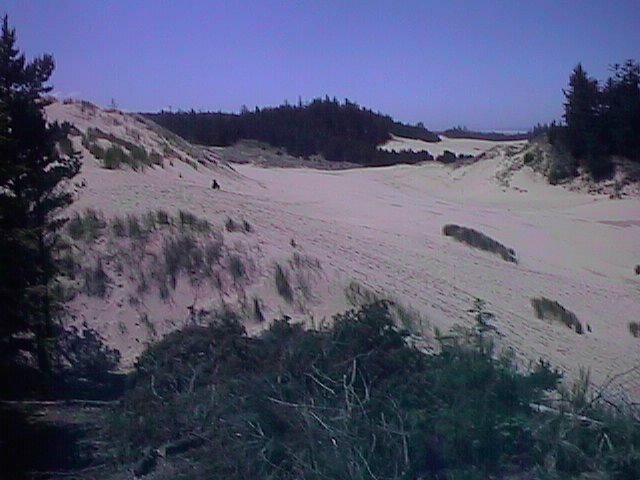 This stretch of coast contains the Oregon Dunes National Recreation area. The dunes were largely hidden off 101, but I did take two quick stops; one at an overlook to wander through the dunes and a second at the visitor center in Reedsport. From there not much further to end at North Bend for a nice day of cycling. North Bend, Coos Bay and Charleston bill themselves as the "Bay Area" of Oregon. Heavy mist as I left at 5:30am. The mist and fog wouldn't clear until after 10am, necessitating frequent stops to clear my glasses. Rather than follow 101, I took the backroads through North Bend, Coos Bay and then off to Charleston. Stopped in at a small store for a few breakfast items while the store owners were busy opening up for the day. From Charleston I climbed a short sharp hill to follow Seven Devils Road. This stretch of road had frequent climbs and then descents. With the fog, there were frequent dropoffs, but it was difficult to see what was down below. After 20 miles or so, the road rejoined 101 just short of Brandon. Brandon was a cute town with an overly touristy town center. Neverless, they had a good breakfast place were I stopped in. The restaurant was full of locals getting breakfast before starting the day. A woman came in with two girls, one looked like she had downs syndrome. Over breakfast her companions were relating, "...they'll still come after you for the debt, since you were his common law wife...". While she still looked upbeat, I briefly compared her situation to mine and felt very fortunate. From Brandon, the road left the immediate coast and over some rolling hills. Coming down one of those hills, was a bit startled by a German cyclist coming right behind and slapping me on the back. This enthusiastic chap was on holiday and cycling from Seattle to San Diego. 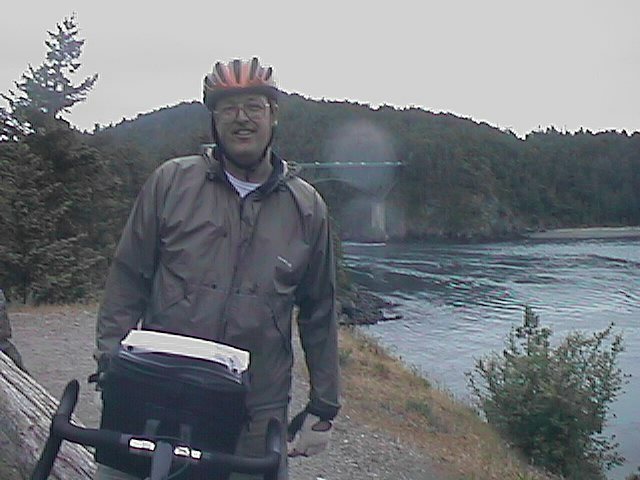 We cycled together for a while, though I left him shortly before arriving in Port Orford. From Port Orford, the scenery became rather dramatic. Nice rocky coast, with cliffs. The road sometimes climbed steeply only to descend down again. The sun was out and bright. On several places, there were signs pointing to smaller beaches and parks. On one stretch, left the coast and climbed out and around Mt. Humbug. Felt a little more tired than expected and decided to stop for the day in Gold Beach. California here I come! While I was already in end of Oregon mode, I first had to climb up and over Cape Sebastian and cycle the twenty six miles down toward Brookings. Coastal morning fog was back again. This added to the overall scenery and sea scapes. I counted five larger climbs on this stretch before the road leveled close to Brookings. 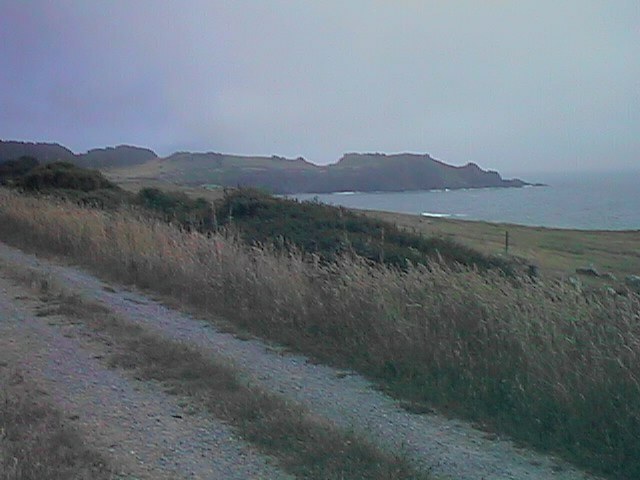 The road rose to ~400ft and alongside were several small secluded coves. At Brookings the road leveled for the last miles to the border. The border had a quick agricultural inspection though they didn't really look at anything on my bicycle. 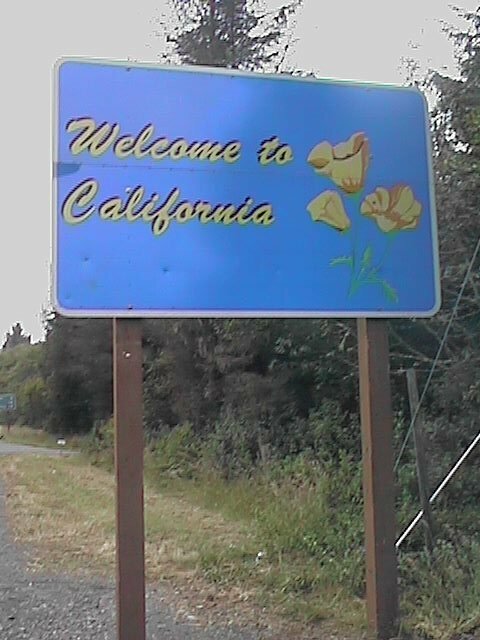 Nice to get to California though. 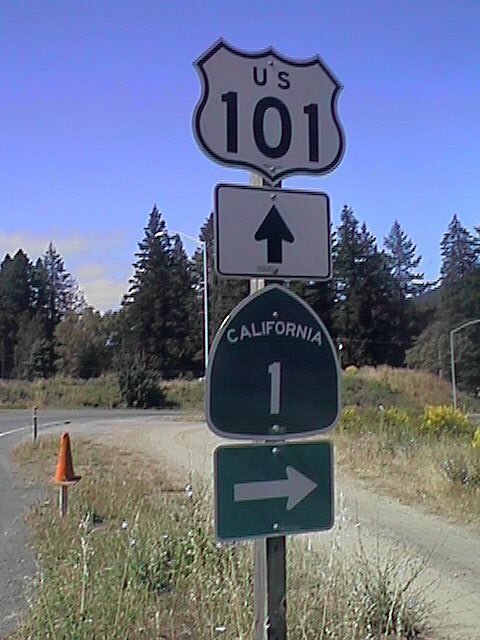 After Brookings, left 101 onto secondary roads. These travelled through many fields of Easter Lilies. Apparently 90% of the US output of Easter Lilies are grown in this area. Quiet backroads to Smith River where briefly rejoined 101 and then took backroads into Cresent City for lunch. While at lunch, the weather changed to light misty rain. Made a few excuses to dawdle such as checking out the Redwoods National Park visitor center. However, it was clear it might now quickly let up. The locals behaved as if this weather was pretty common. From Cresent City I had my first encounters with California Redwoods. A few miles past Cresent City the road quickly climbed up and over a trio of 1200ft hills. The rain mostly turned to mist, ideal for growing the tall redwoods I passed along the way. Put the bicycle in a low gear and slowly climbed up 4.5 miles to the first summit. From here a quick descent, a climb; repeated another time before a nice dramatic descent down to Klamath. 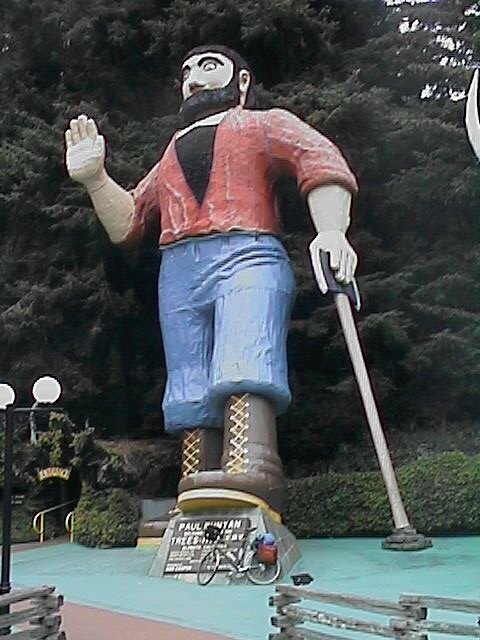 Outside Klamath was the Trees of Mystery, complete with a giant Paul Bunyan and Big Blue Ox. Note the scale of the Paul Bunyon by comparing to my bicycle down below. At Klamath stopped briefly for a late snack before deciding to continue on 101 over the next hill. 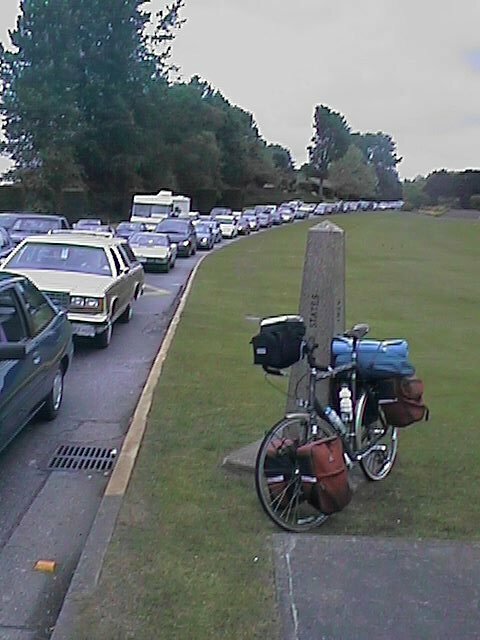 The first stretch of this route was along 101 with minimal shoulders and a fair amount of traffic. Luckily the road split and went onto old 101 through another redwood pack. 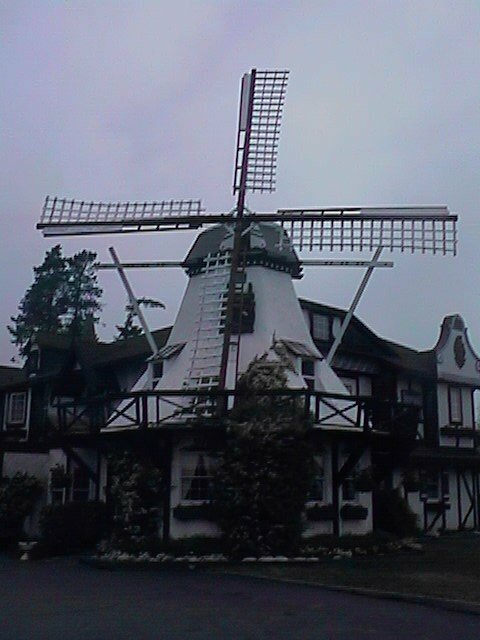 Shortly past the part found a nice German style motel for the night. Woke up to find my rear tire soft but not flat. Pumped it up and figured I would see how it held up. It had rained the night before and this stretch of two-lane road caused passing cars and trucks to raise a bit of spray. Fortunately as I got closer to Eureka, the road leveled, gained shoulders and also widened to four lanes. Felt a bit more like a freeway as I got closer. Left the freeway at an interchange into Trinidad at milepost 100. No cafes open so back to the main road where could stop in Arcata for real. All along the way the road got busier until 101 entered Eureka to get lost in a maze of city streets. On the far side of Eureka, checked out the local visitor center and then rejoined 101. Just as I passed milepost 68, the tire was getting soft again. It had lasted 60 miles since the morning, but still was a concern. I changed the inner tube and found a very small pinhole and a diagonal abrasian. Unfortunately, when I checked the tire, I couldn't find any obvious problems so I patched the tube and remounted everything. At this point I left 101 and climbed the same hill twice as I made my way around Loleta. I briefly caught a glimpse of a few cyclists but wasn't completely sure. After Fortuna, the main road bends away from the coast and inland. 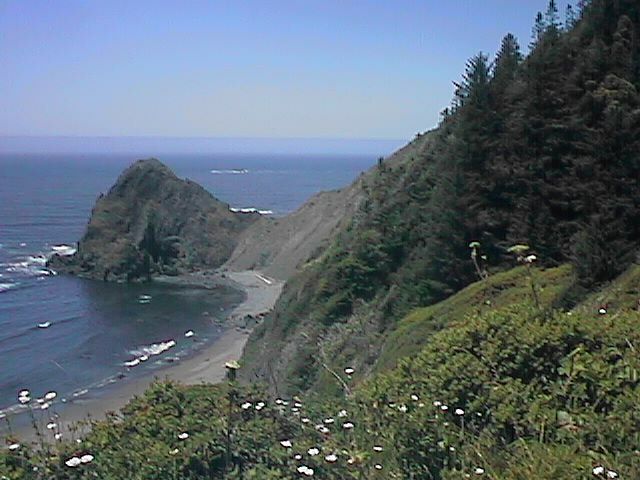 The region bypassed is known as "The Lost Coast" and was apparently too rugged to put the road through. The road does go through very nice redwood groves in Humbolt Redwoods State Park. 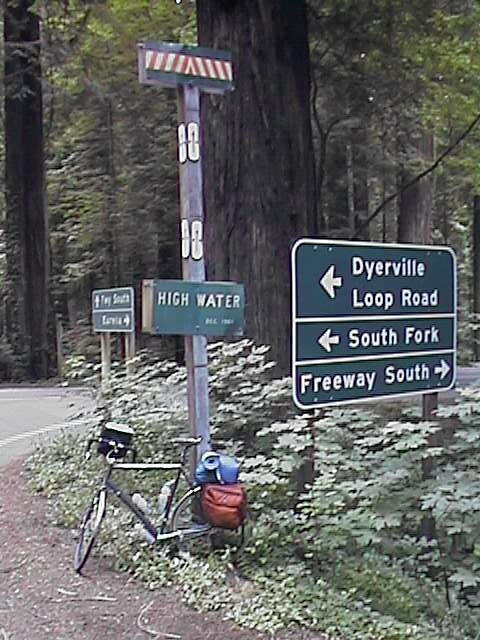 Just before Pepperwood, a secondary road known as "The Avenue of the Giants" parallels 101 the main route. 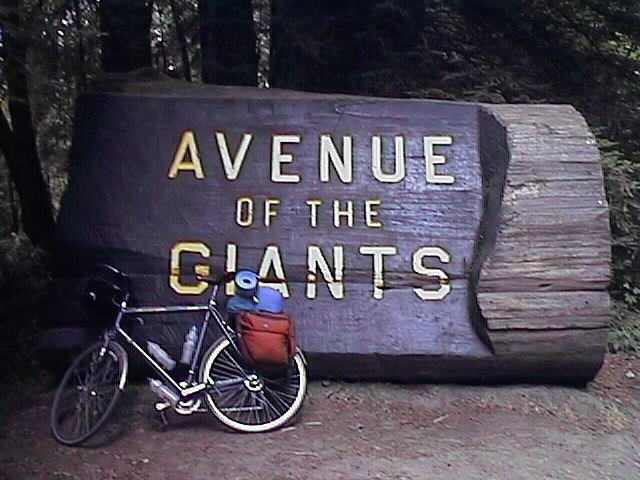 The Avenue of the Giants is a wonderful route going past numerous redwood groves. As I slowly cycled along, I was amazed at the size of the giant trees. It was noticably darker and probably also cooler as I cycled along. Met up briefly with four cyclists making their way from Seattle to San Francisco. While I was a morning rider, they were on the evening schedule and still had many more miles to do when I stopped at Myers Flat for the day. Welcome to the Redwoods! This next stretch of road had several tourist attractions around the giant trees. 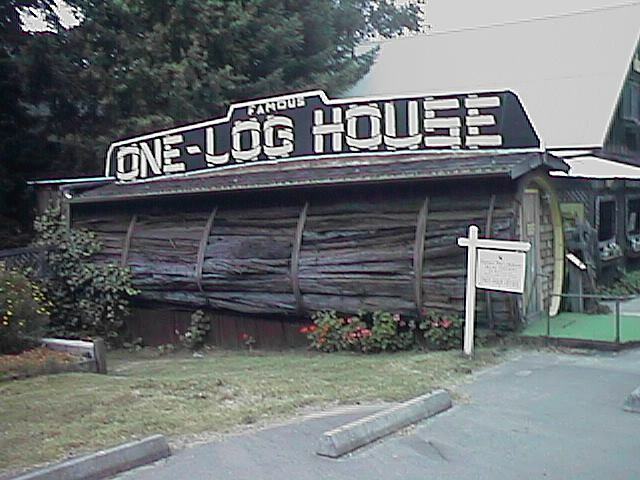 In Myers Flat was a "one log church". This small chapel was carver out of a single tree. 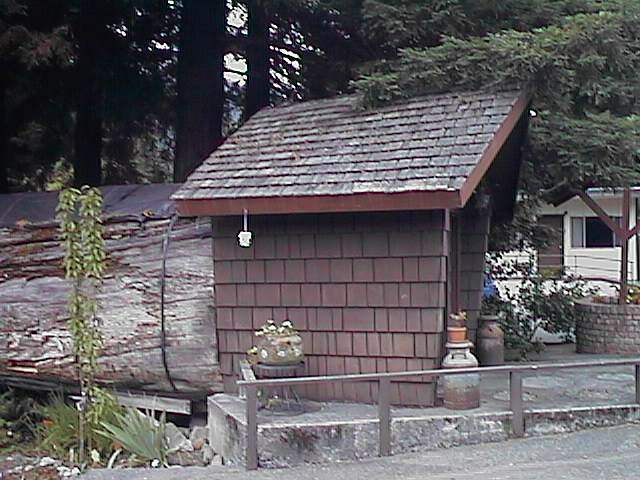 Some ways down the Avenue of the Giants was a "one log house". From the real estate sign this house and gift shop is for sale for the right buyer. 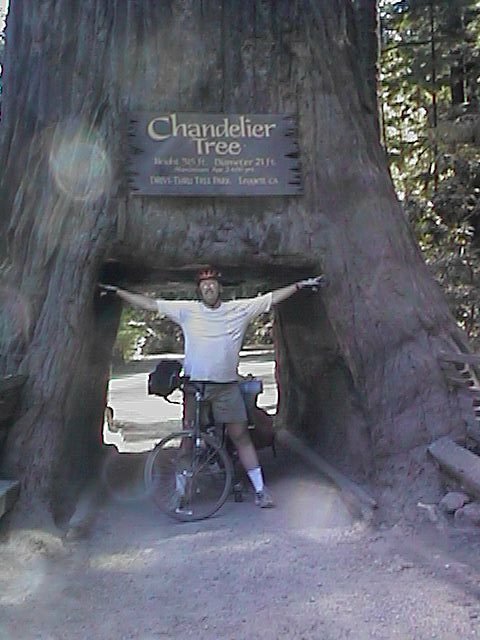 Later in Leggett, I paid my $1 to bicycle to and through the Chandalier tree. The first stretch of the route paralleled 101 before rejoining the freeway. From here it climbed up and over several large hills. Took the exit to Garberville where I met the other cyclists for breakfast. At this point, I had exited the Redwoods and it was noticably warmer. Leggett was a crossroads and the start of route 101. Leggett was also the location of the tallest point 1950 feet at the top of Leggett hill. Ate lunch in Leggett and then put my bicycle in low gear to climb up and over the hill. As I climbed up to the top, I encounted several areas that were newly paved. Wonderful descent coming downhill. At one point however, I came upon a small traffic jam where cars were stopped. I shifted in pedestrian mode and slowly walked my bicycle forward in line. I had come to a second of road being paved. One lane was newly paved and they were leading cars through the other side to be led by a pilot car. The driver of the pilot car told me to "go ahead, but be careful". As I looked behind he was leading the trail of cars behind me. Wonderful to go zooming downhill knowing that I wouldn't encounter any traffic trying to past. Let out the brakes and went zooming downhill. Yikes! Coming the other way was a large asphalt truck. It was in my lane! Not quite certain how this happened, but I quickly stopped and stepped off with my bicycle onto the new blacktop surface and let the truck pass by. It was followed shortly thereafter by a second truck. Of course my trailing pilot car was nowhere to be seen. I zoomed downhill a little more cautiously after that. The hill kept going and going, but eventually flattened out. The other cars eventually started passing. After that I would go for many miles before being passed by many cars at once. Climbed my way over Rockport hill and to the coast! This last stretch had many short climbs and descents along the coast. Also in this stretch, the sun came out for the first time in the day. Stopped in Fort Bragg, largest town around for a while. Today was wonderful peaceful ride with fairly dramatic scenery along the ocean shore. This stretch was also hilly as the road would frequently climb up along the cliffs only to descent down into a cross valley and then slowly climb back out again. Started with a quiet ride through old Fort Bragg. Nice quiet town center and a few rolling hills. A dozen miles further was Mendicino. It was quiet early in the morning, but still looked like a nice little town. From here the route became a bit more rugged as I cycled out to Elk for breakfast. A fancy California style breakfast. What I meant was this was the sort of place whose omlett of the day was Spinach and mushroom and who served things on tinted glass. Still tasted the same even if I was starting to pay closer to San Francisco prices. After Elk the guide book warns you about "the steepest hill on the coast". I felt pretty good as I climbed out from Elk. Unfortunately, found out a few miles later that this wasn't the real hill. After Manchester the route became a bit more quiet and rugged. Gualala was a somewhat busy town and a good place to stop for lunch. Gualala was also the county boundary into Sonoma County. South of Gualala was the community of Sea Ranch, a ten mile stretch of coast with private roads and many vacation homes built. Got to a more normal coast after that and decided to stop for the day at a small resort in Ocean Cove. Home stretch! Got out on the road early as I'd figured out it would be fairly easy to get home today. As I got close to Fort Ross, I encounted a sign that warned of road closures and suggested the alternate route along with notation that the alternate route climbed 18%. An 18% grade is definitely worth some investigation to see what could be done to avoid it, so I continued straight on the route I was on. Shortly after I entered Fort Ross, I passed a few stretches where the road was one-lane because portions had slipped into the ocean. 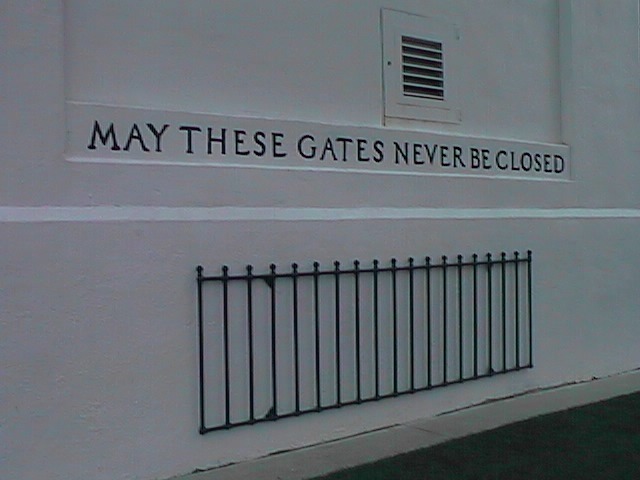 Fortunately, still easy to get past. What wasn't quite as easy was going past the gate shown above. Easy to get past on a bicycle but not other vehicles. I slipped onto the closed road. Wonderful quiet ride as I knew I had the road to myself. Saw several antelope and also rabbits. Heavy fog and mist. Several cattle grates but no other obvious signs of cows. At one point, the road had clearly fallen into the ocean, but they had just carved out another route and had a gravel surface. Enough to get by. The route climbed up and over the hills before coming to a second fence and then rejoining the main route again. Waited for the cafe in Jenner to open and talked briefly with a couple from San Diego. They were also on bicycles doing the Seattle to San Francisco segment. They left on their bicycles while I waited for breakfast. After breakfast I caught up with them and briefly rode with them for a bit. Nice bakery in Tomales. The road headed inland here before going past Point Reyes. Nice easy ride along the bay before heading inland in Marin County. The official route departs from highway #1 because of extra traffic and narrow shoulders. Cycled past Samuel P. Taylor park before hearing a loud hiss as my rear tire went flat. A long diagonal slice about half an inch long in the outer tire and a large hole in the inner tube. Interestingly enough the slice matched up with the abrasion I had earlier outside Eureka, so most likely this problem had actually started much earlier. I didn't have a spare tire, so used black eletrical tape to form a boot. Hopefully this would last until I got to San Francisco. Under inflated the tire slightly just in case. Crossed over into Larkspur. Getting close now! The route followed an intricate set of city directions with frequent turns. Paralleled 101 for a while before crossing into downtown Sausolito. From here cycled up and over the Golden Gate Bridge, down through San Francisco and on to the train station. Caught the 7pm train back for an end to this part of the trip.